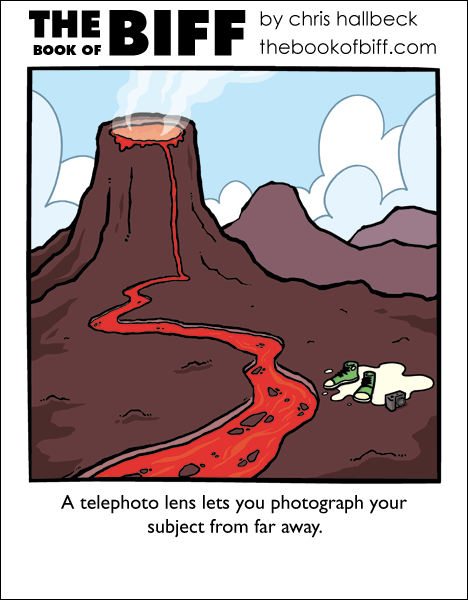 Biff’s doing research on volcanoes again? What’s he up to, I wonder? Tweet notwithstanding, it would appear that Biff is in fact made of cheese. Recipe: Pour molten Biff into several ice cube trays. Cover with cling wrap. Stand a toothpick in each well of the ice cube trays by poking them through the cling wrap. put in freezer for three hours. Biffcicles for the whole party. Ah, finally, just what I needed for my nachos. Biff looks more like melted French vanilla ice cream here to me. I hate when my eyeballs melt. Biff is being an extremely good sport, giving his quarry (Kee Rock) a fighting chance. And the theme is also dark. Biff does not wear a sissy white dress. Biff is a Black Clad witch. Good old Biff. He never dies. He might melt, but he never boils away. And where did he *get* those shoes? It appears substance “Biff” has a lower melting point than substance “rubber-soled shoes”. More research(and funding) is needed to determine if the shoes are more extraordinary than the Biff. “Biff” may be a name from Death of a Salesman, but somewhere a shoe store is busy printing up application forms. Ah yes, fun around the campfire… Brings to mind a beach-camping + campfire-Margarita moment when I discovered those rubber flipflop sandals silently melt near fire and your first stagger back to the tent fuses half the beach sand to the bottom of your shoes… Of course you don’t realize this til the next day, when you try to walk on a non-beach surface and fall over! I can’t help but think a better title for this would be Igneous.